For fans of ancient Ireland, Lough Gur is not to be missed. Deep in County Limerick, Ireland, this place is a true hidden gem and one of the most important archaeological sites in the whole country. The visit lends itself to a full day excursion if you are going to take in both trails. There are two main trails here which explore the archaeological remains. The first one is a lovely 2km hill walk starting at the visitor centre with archaeological remains and places of legend along the way. The second requires a car to get to nearby sites including two stunning hill forts and the largest stone circle in Ireland at Grange. You can get either tour narrated by streaming an audio guide from this link. The visitor centre (seen above) helps to put the monuments you will see in context. It has some lovely interactive displays for children, and breaks down the rich history of the area into easily digestible chunks. A visit to the visitor centre will cost €5.00 per adult, €4.00 for Senior Ciizens, €3 per child over 6 years of age, Family Ticket €15.00. There is no charge for visiting any of the monuments. The visitor centre sells hot and cold drinks and a small selection of sweets and bars. There are toilet facilities near the car park. There is a picnic area in a beautiful spot at the lakeside near the visitor centre and car park. Families come here from Limerick to be out in nature for the day. If the weather is hot some will swim in the lake. There is ample free parking. Above: Sculpture along the path of the 2 km hill walk. 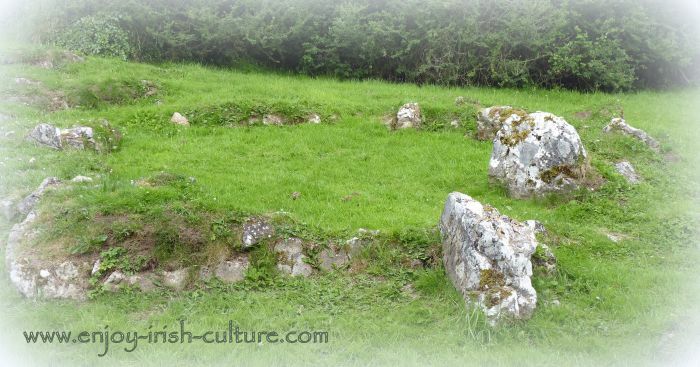 Settlement around Lough Gur started during the stone age, around 4000 BC. By the bronze age, this was one of the most densely populated areas in ancient Ireland. Settlers, who were farmers and fishermen, were attracted by fertile soils and other plentiful natural resources such as fishing in the lake. There are in and around thirty ancient so called ‘field monuments’ here such as stone circles, standing stones, megalithic tombs, and cairns. The area continued to have a rich history into late medieval times. The Spectacles (seen above) is an archaeological site with remains of early medieval houses and a medieval field system. From the air the remains look like a pair of spectacles- hence the name. 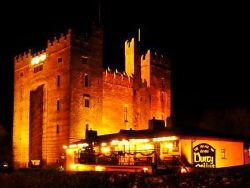 The Desmond Castle speaks of a different episode in Ireland’s history. The Castle belonged to the powerful Anglo-Norman Fitzgerald family and was one of their top three seats. Like all Anglo-Normans, the Fitzgeralds were loyal to the Crown. But by the 16th century this loyalty had worn thin. London was far away. Local interests and local loyalties often took precedence. 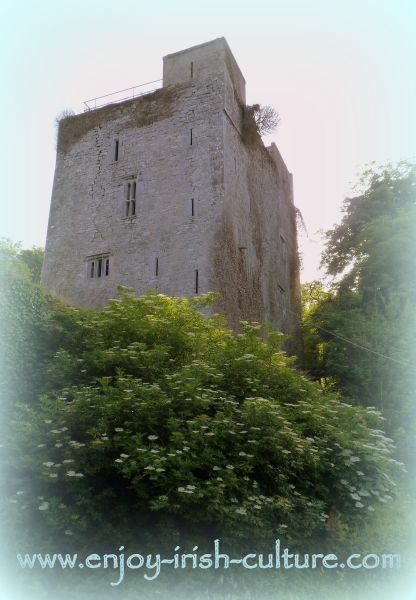 Gerald Fitzgerald, the 15th Earl of Desmond, gained fame and notoriety in an episode that took place at this Lough Gur castle when he openly wore the dress and robes that Irish chieftains wore at the time, thereby symbolically declaring his parting with the Crown. He had been imprisoned in London, and had managed to escape in 1573- now he became part of the first Desmond rebellion against Elizabethan colonialisation which his relatives had started in his absence. The castle is located only a short walk from the car park. Make sure to take a look. Unfortunately it is part of a working farm (It should be a National Monument we say!!!) and you can only look at it from over the fence. Above: The Desmond Castle- unfortunately part of a working farm! Another more recent piece of history associated with the area around Lough Gur is that American President John Fitzgerald Kennedy’s grandfather came from here. The connection is honoured in a small local theatre performance at the ‘Honey Fitz Theatre’. Apparently the man had a very sweet singing voice, hence the nick name Honey Fitz. John and Gertrud Hunt who collected antiques and artwork and gifted their entire collection as well as a freshly restored Bunratty Castle and a vast estate turned into a heritage park at Craggaunowen to the Irish people, used to live in this area. Their collection is now on display in Limerick City at the Hunt Museum. Door of the mysterious Desmond Castle. 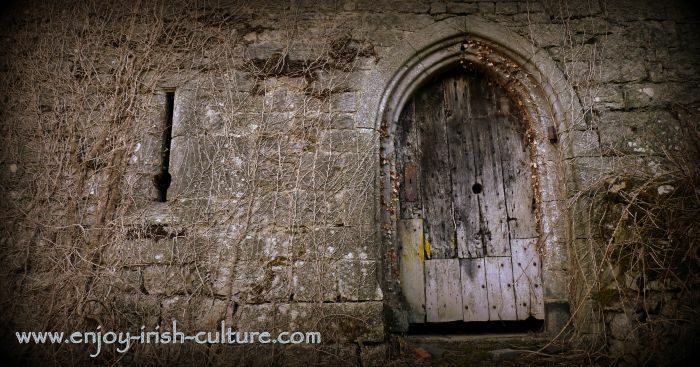 There is a very special atmosphere at Lough Gur that we felt as soon as we arrived. For one thing, you are in a beautiful spot out in nature. But there is more to it than that. You can really feel the presence of ancient Ireland here. With so many monuments in such a small area, prehistory becomes very tangible. For Irish history fans, this place is the ‘bees knees’. A visit here rejuvenates and gets the imagination going. What might life have been like for people in ancient times? 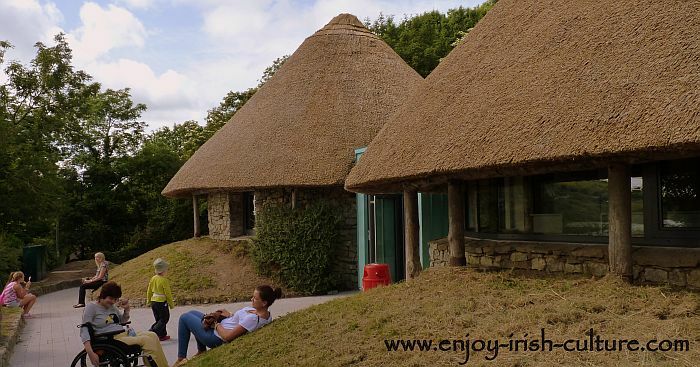 Because the area is quite spread out and exploring it involves being out in the open, you sort of need good weather really to make the best of a visit to Lough Gur. So, we say, think ahead to your visit, but don’t fix the date. Be prepared, but be flexible. Then, on a fine morning, be ready to leave early and make a day of it. 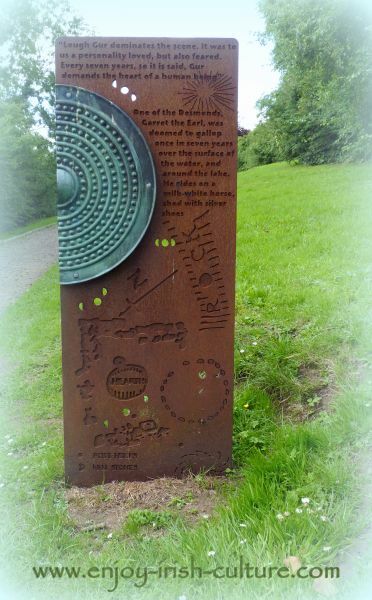 Have your map of the sites at Lough Gur ready to go. If you forget to download it, get a map from the visitor centre so you can find your way around the different sites. It’s a great help! Get your map of Lough Gur here. Bring a picnic. There are only one or two places in the area where you can get food, and you don’t want to be committed to looking for them. Instead, use the picnic facilities provided. Just buy in hot and cold drinks from the visitor centre. 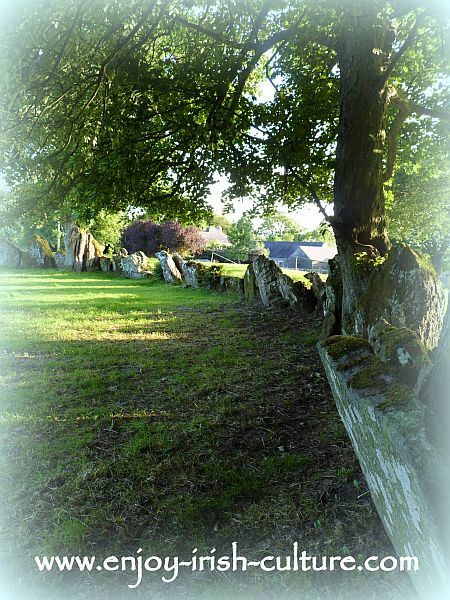 If you have to prioritise sites due to a lack of time make sure to include Grange stone circle which is about 4 km from the visitor centre and easily found with the map you can get hold of there. Make sure also to take a gawk at the Desmond Castle which is very near the car park, and at the crannog which is only a five minute walk from there along the lakeshore. Listen up if you are bringing kids: there are ducks in the lake so you might want to bring some (fresh!) bread to feed them! 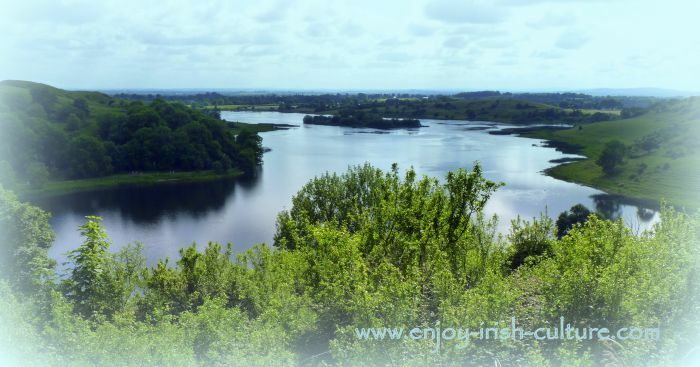 We hope you found this page on Lough Gur both useful and informative! If you like what we do on this website, how about spreading the word to your friends? Simple use the social options at the top left or at the very bottom! Thanks a million and warmest regards from Colm and Susanna.